Pablo Hernandez was interviewed by Spanish media today in the training session. 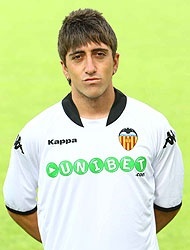 Now that Joaquin has left, Pablo is the main player for the right wing position. On the departure of Joaquin he said: "I have always worked to feel important. I have enjoyed three years with Joaquin. I've learned a lot from him and I had to do the best." About the team he said: "The team looks good, we are working very hard on the training sessions and each day we get better. I'm expecting an exciting season, we had few good arrivals at the club and I'm excited that next year we'll be even stronger. Our goal is to play in the Champions League, but also try and catch up to Real Madrid and Barcelona." He agreed with Unai emery that this season is going to be tougher: "It was a success to finish third the last two seasons. Malaga is now doing a big project, but do not forget Athletic and I would also include Getafe. Of course the teams that always aspire high positions are Villarreal, Atletico and Sevilla." When asked about the arrival of Piatti, Pablo said: "There is going to be a strong competition between me and him, but its going to be a healthy competition for both of us. Last season I was competing with Joaquin, so I know its going to be a tough competition, and I know what to expect. Pablo Hernandez also confirmed that next season he is going to wear the number 19 shirt and not the number 7 shirt as many have predicted. He said he feels the number 19 shirt brings him luck.